Some unwritten rules: Always allow people to first exit the elevator before you get on it. When the host starts cleaning, it's time to leave the party. Never eat a tuna fish sandwich while sitting next to a colleague. Ever. Certain foods must be eaten in the confines of a HazMat suit. No matter how delicious tasting your lunch may be, its powerful stink is not something your fellow officemates should endure. Of course, there are circumstances that cannot be avoided: Your sandwich came with onions, you just paid rent and eggs are all you can afford or the whole team decided to order Korean. All unfortunate, but permissible. It'd be wise to study the chart below, which scales the biggest office food offenders from annoying-but-tolerable to entirely ruthless. 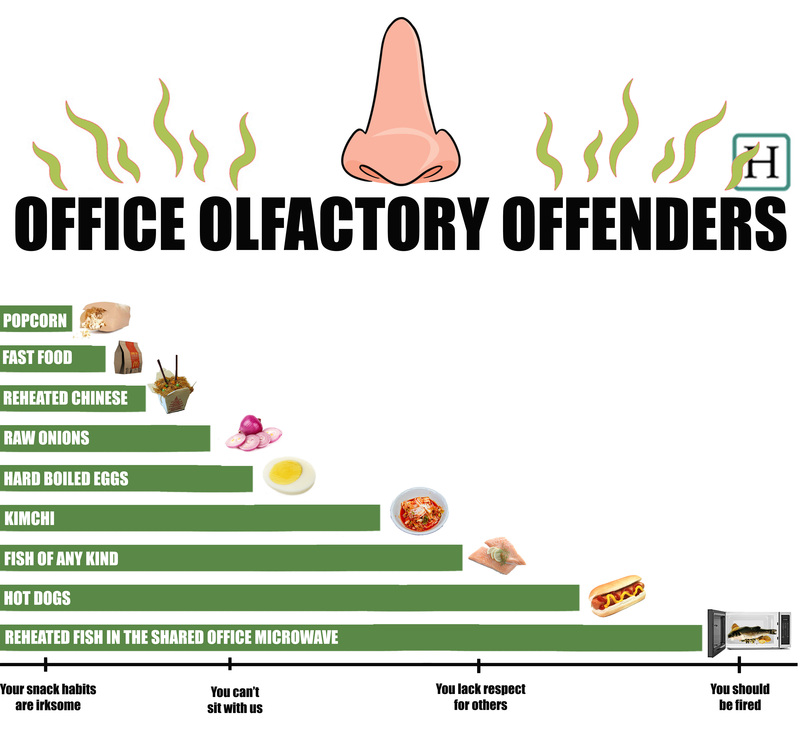 Don't run the risk of being pegged as the smelly coworker who reeks of fish. It's not worth it. Images by Getty. Infographic by Kate Bratskeir/The Huffington Post.